Russian Circles released their most recent album, Empros, last October via Sargent House and it was a barn burner. Empros picked up where the anthemic riffs and melodies of 2009?s Geneva left off and injected evermore slithering rhythms amid skull-crushing heft with all the visceral intensity of Godflesh, Swans and Neurosis. For all intents and purposes, it was a radical revision of both heavy and melody that is monolithic in its clarity and perfection. Coupled with an unparalleled live show that was as masterful as the album it supports, Russian Circles have been road warriors in 2012 in support of the fantastic effort. Ghettoblaster Magazine recently caught up with bassist Brian Cook (who is probably the nicest and most thoughtful band dude we’ve ever interviewed) to talk about his favorite record, Minutemen’s Double Nickels on the Dime, as well as some of the albums he’s been instrumental in writing. Minutemen’s Double Nickels on the Dime. I don’t have a specific memory of buying the album. 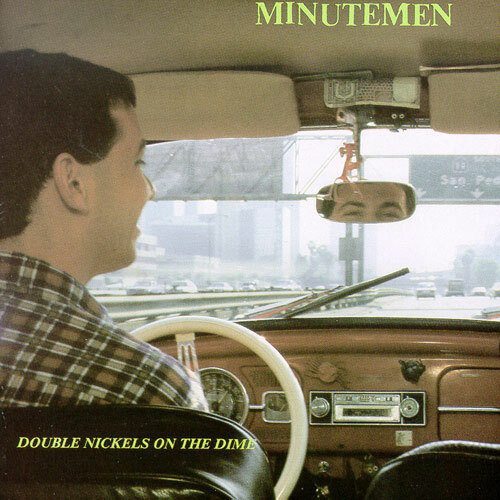 I already owned the first and third “Post-Mersh” collections and knew that Double Nickels was the definitive Minutemen album, but I lived in Hawaii at the time and it wasn’t always easy to track down punk stuff. I would’ve been 14 at the time I bought it, and if memory serves me correctly, I think I found the CD at Jelly’s, which was this record and comic book store in Honolulu. It’s just a great song. Great melody, great interplay of instruments. D. Boon and Mike Watt had such distinctive tones. Boon was always super trebly; Watt had the warm low end bass. But on that song the two of them blended in a way that was really unusual for them. The fact that the song is basically about their childhood and being best-friends seems really fitting for the way they came together sonically on that song. The whole opening line—“our band could be your life”—is massively influential in its own right. And D. Boon’s tragic death just a couple of years later makes the song even more emotional and moving in today’s context. It’s so epic. I mean, it’s 45 songs clocking in at 80 minutes. I bought it around 20 years ago, and I still hear new things every time I listen to it. Earlier this year I took a stab at learning all of the bass lines off the record. I got a bit sidetracked by touring, so I only got side A knocked out. But it gave me a whole new appreciation for how talented and unorthodox that band was. Some of those bass lines are just so bizarre. And hearing about all the different layers of meaning on that record makes it pretty fascinating as well. I read James Joyce’s “Ulysses” last year after hearing Watt mention that the book had a big impact on the creative process for Double Nickels. Joyce said “Ulysses” was a puzzle people would be solving for decades to come, and I feel the same way about Double Nickels. It’s the most sophisticated work in their catalog. I recommend it to people all the time, but I also know it’s not the most immediately accessible album. There were a handful of songs off of it that I liked immediately, but it took me a couple of years to really appreciate the bulk of it. I almost think it’s more of a record you have to approach on your own and spend some time with to really appreciate. You can’t force it on anyone. That’s a hard one. I’m really proud of the last two Russian Circles albums. I feel like it’s the kind of music I wanted to make for a long time but just didn’t have the capability to do it. And I’ll always be proud of what Botch was a part of when we recorded We Are The Romans. My favorite bass lines are probably on that last These Arms Are Snakes album—“Woolen Heirs,” “Prince Squid,” and “Lead Beater” specifically. I also played in a pop band called Roy and we did an album called Killed John Train and I have to guiltily admit that I still listen to pretty regularly. Is it bad business to admit listening to your own records? Well, I fucked myself on this one by listing off more than one record. With Russian Circles, I’m really proud of the song “Melee” off of Geneva. I really like the dimension the string section brings to the song. Unfortunately, it means that every time we’ve tried to play the song live, it just seems empty. I’m glad we went out on a limb and did a lot of extra instrumentation on that record, but we also learned to be careful that we can pull off the stuff we’ve recorded in a live setting. 8/6 Milwaukee, WI – Cactus Club ! 8/7 St. Louis, MO – Firebird ! 8/8 Louisville, KY – The Veron Club ! 8/9 Birmingham, AL – Bottletree ! 8/10 Tallahassee, FL – Retrofit ! 8/11 Orlando, FL – Will’s Pub ! 8/12 Tampa, FL – State ! 8/13 Jacksonville, FL – Jackrabbits ! 8/14 Atlanta, GA – The Earl ! 8/15 Carraboro, NC – Cat’s Cradle ! 8/16 Washington, DC – Rock n Roll Hotel ! 8/17 Philadelphia, PA – Union Transfer ! 8/18 New York, NY – Highline Ballroom ! 8/19 Cambridge, MA – Middle East ! 8/20 Montreal, QC – Il Motore ! 8/21 Toronto, ON – Lee’s Palace ! 8/22 Grand Rapids, MI – Pyramid Scheme ! 8/23 Chicago, IL – Lincoln Hall ! 8/24 Minneapolis, MN – Triple Rock !